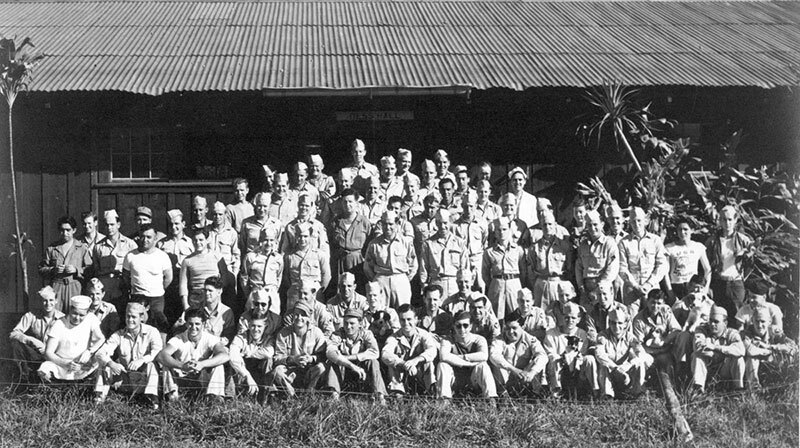 The Kōkeʻe Civilian Conservation Corps. Camp was complete and functioning by 1935. Most of the 1,300+ C.C.C. Camps built around Hawaii and America have long since disappeared. The 11-building complex at Koke’e State Park is among the most nearly complete in the nation. The camp housed young men ages 17 and 28 between years 1935 and 1942. Their mission was to plant trees for watershed retention and improve park infrastructure following devastation of a large fire in 1887 and subsequent decades of cattle pasturing and overgrazing by feral goats and cattle. Many trails were built by the corpsmen including the Alaka‘i Swamp Trail and Hā‘ena-Kalalau Trail. Many remote roads were built to access planting areas that are used today as fire roads in case of wildfire. A satellite camp at Waialae was built and part is still used to day. The C.C.C. gave the Territory’s Board of Agriculture and Forestry a tremendous boast to accomplish forest management and natural resources conservation objectives on Kaua‘i. In 1943 the camp became headquarters for men of the 443rd Aviation & Construction Battalion. Their mission was to construct an alternative communications line through the Alaka‘i swamp to Wainiha. As part of that project, they bulldozed the plantation ditch trail to Mōhīhī, creating a road. Following the war and the camp’s use by various military groups, the Camp was used the Air National Guard. Following the building of their own facility, there was irregular community use by church and service groups until 1966. The Federal Government then began a series of programs that made use of the facility. The Jobs Corps program was headquartered at the camp until 1973. The Youth Conservation Corps followed. They were the last group to regularly use the camp. The 1982 hurricane, Iwa, destroyed the old Recreational Hall and the camp was effectively abandoned. The historic camp (site map) had been abandoned after Hurricane Iwa ravaged Kauaʻi in 1982. Only one building, the recreation hall, was destroyed by the storm. The rest of the buildings were fairly sound, but battens were missing and windows broken. Hunters began to camp in the old buildings with their dogs. Stainless steel kitchen tables “walked.” A muddy track traversed the camp’s central quadrangle, choked with weeds. Blackberry brambles engulfed the buildings up to the eaves. Interiors were dank and filthy. Hui o Laka saw the potential of this abandoned cluster of buildings. Needs could be filled: the organization needed offices and overnight accommodations and space for volunteers. Visiting researchers from all over the world really needed overnight accommodations in the parks. On January 5, 1990, Hui o Laka submitted its first grant-in-aid request to the Hawaiʻi State Legislature to renovate the abandoned camp. It was proposed to name the center in honor of Joseph M. Souza, Jr., a one-time Kōkeʻe forest ranger who became the director of Hawaiʻi State Parks from 1964 to 1978, and co-founder of Hui o Laka. Souza never knew the project would be named for him, when told about the renovation plans weeks before his death on January 6, 1990. Although grant money was a major component of renovations to the CCC Camp between 1990 and 2009, the bulk of the repairs and renovations were through volunteer labor and member contributions. As soon as Hui o Laka staff and volunteers dived into the nitty-gritty of rescuing the old camp — scraping black-out paint off windows and fighting brambles — old timers began showing up with stories. Hui o Laka collected oral histories and made copies of family scrapbook photos. The previously undocumented history led to the designation of the Kōkeʻe CCC Camp as a Hawaiʻi State and National Historic Landmark in late 1996. Work continues on and the camp now can serve up to 50 overnight visitors at a time. 2015 C.C.C. Camp furnishings upgrade program. Donations to-date has come from: Diamond Resort International’s Point at Pōʻipu; West Kauaʻi Visitor Center; and Tom Summers Realty. Upgrades are ongoing and any useful donations to upgraded and improve the accommodations are welcome. “The New C.C.C.” (Kōkeʻe Community Conservation Corps) campaign launched October 2013. Goal $150,000. $50,000 (2014) Grant-in-Aid from the 2013 Hawaiʻi State Legislature, to be used for continuing camp renovations. $306,000 (2011-2012) Grant-in-Aid from the 2007 Hawaiʻi State Legislature to Kauaʻi Planning and Action Alliance, used for renovations to the Barracks A & B. $900 each (1999-2003) 20 “Millennium Members” boosted renovations during special campaign. $7,000 (1994-1999) Community “Door-nors” donated the value of a new interior or exterior door for the camp. $14,601 (1993) Pacific Asian Travel Association post-hurricane contribution, used to replace Mess Hall roof. $20,000 (1991) Grant-in-Aid from the 1990 Hawaiʻi State Legislature, used for planning, including preparation of an environmental assessment.